"The Great Hereafter" is the forty-fifth live-action segment of The Super Mario Bros. Super Show!. Its corresponding animated episode is "Stinging a Stinger" from The Legend of Zelda. Inside Mario Brothers Plumbing, Mario is asleep on the couch, having a nightmare about his Grandma. Speaking aloud, Mario apologizes to his Grandma over something, only to be woken up by Luigi, who brings him to his senses and reminds Mario that he's been daydreaming about Grandma again. Mario appologizes, exclaiming that Grandma had been right in front of him, plain as the nose on his face, and that he could feel her. Sitting down next to Mario, Luigi assures Mario that he worries about the dreams he's been having about Grandma, which imply that's she trying to reach out and communciate with from beyond the great barrier; Newark, where she is burried. Mario, however, cannot understand how she's able to talk to him from where he is, and is unable to comprehend what she is saying. Mario then suggests that they should call "that psycho lady", whom Luigi wrongly assumes is Mr. Shwect, their crazy neighbor in apartment 3A. Mario describes her as an old lady with an evil eye who can call fortunes and tell things before they happen. Luigi then corrects Mario in saying that she's psychic, not psycho. At that moment, the doorbell rings and Luigi tells the visitor to enter. She does so, and introduces herself as The Old Psychic Lady with the Evil Eye Who Reads Fortunes and Knows Everything Before it Happens. She then tells Mario to watch it with any psycho cracks, as she is very sensitive. 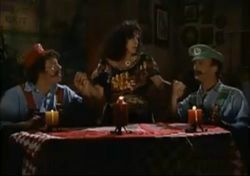 After dimming the lights and lighting some candles at the table, The Old Psychic Lady deals out several oversized playing cards to Mario and Luigi and tells them their fortunes for each card they receive, which vary greatly. Luigi then announces that his cards make up a royal straight flush, while all Mario has to claim is a busted flush. The Old Psychic Lady isn't too worried about Mario's hand, since he is a plumber. Mario, Luigi and The Old Psychic Lady then hold hands and try to contact the living, despite Mario and Luigi's objections that their Grandma is dead. The Old Psychic Lady explains that it's all the same to her on the etheral plane, and tells Mario to empty his head of all thoughts. She then calls forth in the name of Mario's tortured soul, but is unable to finish her line, since she doesn't know their Grandma's name. Mario reveals that it's Mario, whom he was named after. The Old Psychic Lady assumes that Mario must've been teased as a kid for this fact. Luigi begins to bring up other reasons as to why Mario was teased, but Mario tells them to get back to reaching Grandma Mario. The Old Psychic Lady appologizes to Mario, and continues with calling out to Grandma Mario. Suddenly a tamborine and a trumpet can be heard nearby, which The Old Psychic Lady assures Mario and Luigi that it signifies the announcement of a prescence. At that moment the table slowly rises into the air, and The Old Psychic Lady smacks Mario. She then yells at him in Grandma Mario's tone of voice, and Mario warns Luigi that Grandma Mario is back. The Old Psychic Lady then yells at Mario and Luigi for living in place so dirty she can't even put it into words. Luigi suggests a dump, but The Old Psychic Lady tells him to shut up and not talk back to her. The Old Psychic Lady then cries that seeing Mario and Luigi's dumpy apartment breaks her heart, and that she's the laughing stock of her neighborhood, which she cannot remember the name of. Mario and Luigi guess that it's Newark and Upper Newark respectively, but The Old Psychic Lady tells them that Grandma Mario is too stupido to recall. The Old Psychic Lady then tells Mario and Luigi to clean up their home, tells Luigi to wash behind his ears, and then tells Mario to clip his nose hairs, so that maybe she can rest easy, even in Newark, before fainting in her chair. Mario tells The Old Psychic Lady to wake up, and she does, no longer possessed by Grandma Mario. Mario is relieved now that Grandma Mario's spirit is free at last. However, The Old Psychic Lady tells them that hers isn't, and charges Mario and Luigi one hundred dollars for her services. Luigi points out that he got a royal straight flush with the nine, ten, jack, queen, king and ace of spades. In actual poker, which is only played with five cards, the nine wouldn't qualify as part of a royal straight flush. This segment is one of the five live-action episodes included on Shout! Factory's The Legend of Zelda DVD set. ↑ Die Super Mario Bros. Super Show! - Vol. 3. pidax-film.de. Retrieved September 14, 2017. ↑ Gilchrist, T. (September 8, 2005). Legend of Zelda on DVD!. IGN. Retrieved August 26, 2017. This page was last edited on July 27, 2018, at 03:11.